Originally posted by Rena Anya Devéza on December 11, 2013 at AlexTechReport.com. It was snowing that morning. 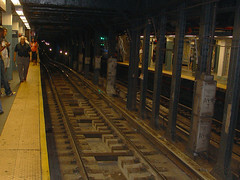 I was in the Times Square station, changing from the Broadway local to the BMT to go downtown. It was rush hour. People were wet, angry, in a rush, pushing. Even though I was going downtown for another yucky medical test, and even though I was in the middle of a collective grouch scene, well, I realized that I was floating. I felt so light, I was lengthening and widening, I was not gripping in my knees or my elbows, as is my want. I just felt great. Wow…Alexander Technique! I was under the spell of my recent spate of five lessons within eight days, all my AT lessons in general, along with my one semester of teacher training. I was luxuriating in all that. I was thinking that if I could feel so great in such circumstances, under the status quo, well, the transformation that I will undergo during my hopefully soon to be resumed training will be enormous. Happiness!